WASHINGTON ? 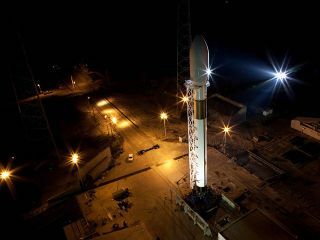 SpaceExploration Technologies (SpaceX) has requested a Feb. 2 launch date for themaiden flight of its new Falcon 9 rocket, according to a recent launch rangeforecast issued by the U.S. Air Force?s 45th Space Wing. The Hawthorne, Calif.-basedSpaceX said in early October that it expects to deliver Falcon 9 flighthardware to the Cape Canaveral Air Force Station, Fla., launch facility inNovember and then launch one to three months later. Falcon9?s debut originally was planned for 2007 but development of the rocket ?along with that of its smaller sibling, theFalcon 1 ? has taken longer than SpaceX expected. But the new launch targetcomes with a caveat. SpaceX?s proposed 11 a.m. EST (1600 GMT) liftoff wouldconflict with an already approved United Launch Alliance Atlas 5 launch ofNASA?s Solar Dynamic Observatory, according to the range forecast released Oct. 28. SpaceX said as recently asOct. 21 that the inaugural Falcon 9 launch is a demonstration flight that willcarry a prototype reusablecargo-carrying vehicle being developed with NASA funding help. The missionwill provide aerodynamic and performance data on the Dragon capsulequalification unit, although the primary customer for the mission in a U.S.government customer SpaceX says it is not at liberty to name. SpaceX officials have saidthe flight is not intended to count as one of the Dragonflight demos SpaceX is obliged to fly for NASA under its Commercial OrbitalTransportation Services (COTS) agreement. That 2006 agreement promised SpaceX$278 million in incentive payments in exchange for three demonstrations ofDragon?s ability to deliver cargo to the International Space Station. The first demo was to haveoccurred in September 2008, followed by a second in June 2009 and a third inSeptember 2009. In February 2008, SpaceX and NASA amended their COTS agreement,rescheduling the first Dragon demo flight for June 2009. In addition to its COTSmoney, SpaceX received a $1.6 billion NASA contract in December 2008 to haulsome 20 tons of cargo to the space station between 2011 and 2016. While SpaceX works to getthe first Falcon 9 off the ground, the company continues to press NASA andCongress for funding needed to modify Dragon and demonstrate its reliability asa crew-carrying vessel. SpaceX Chief Executive ElonMusk says that Dragon could be made ready to carry crews approximately threeyears from the time NASA provides the funding to make the necessarymodifications, which include development of a launch escape system. SpaceX spokeswoman CassieKloberdanz did not immediately respond to a request for comment on the Februarylaunch reservation. Video - SpaceX's Falcon 1 Rocket Launch Success!